The other Pacific Coast Highway. We stayed in the teeny seaside town of Hahei for two days, soaking up sun and saltwater on the beach, and Becky even got a little sunburned. We managed to go swimming for a bit, cold as it was, until a rogue wave knocked us over and thievishly made off with Becky’s sunglasses. At nearby Hot Water Beach, we joined the crowds to dig our own hot saltwater pools in the sand, which are fed by underground, geothermally heated water. A full moon rising over the Pacific Ocean and the beach at Hahei. 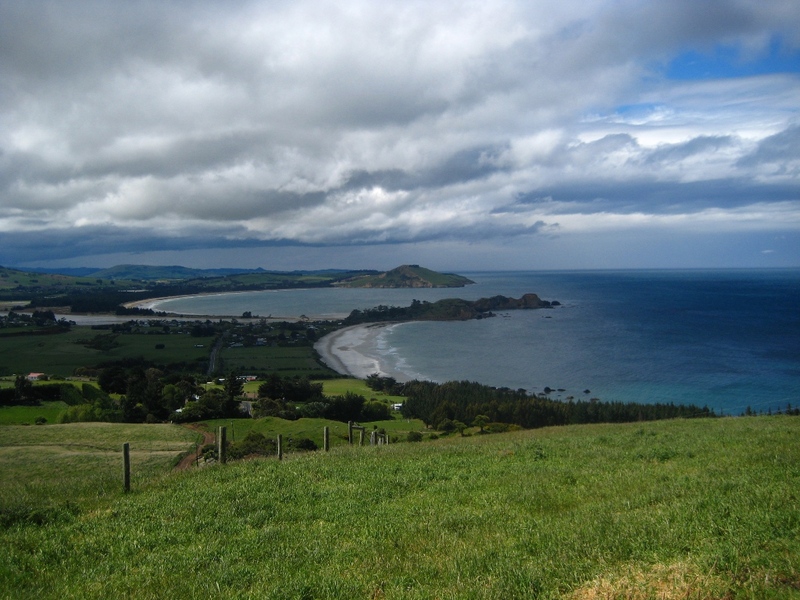 We traveled on to Coromandel Town on the other side of the peninsula. 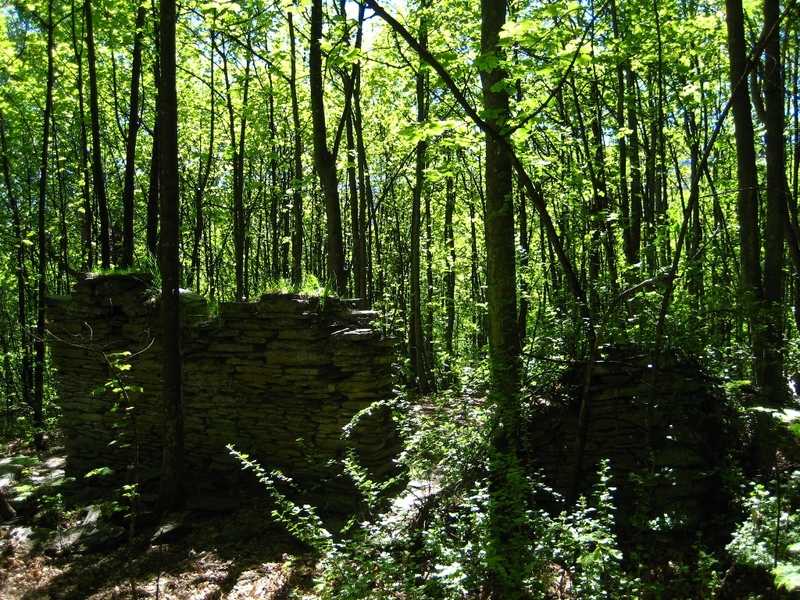 The nearby Driving Creek Railroad was built over the course of twenty-six years by a local potter, who uses it to get clay from the nearby mountainside to his workshop. We got to ride the narrow-gauge railway up to a great viewpoint of the surrounding forest reserve and coastline. Looking down from the punnily named Eyefull Tower at the end of the Driving Creek Railroad. Our last hurrah in the Coromandel was an afternoon sailing trip aboard the Trifecta, a nearly 30-foot trimaran sailing boat that was built from scratch by the skipper/owner who took us out. We were the only two people who’d booked for that day, so we ended up getting a spectacular personalized trip and one-on-one basic sailing instruction. Jonathan tries his hand at the helm while Becky scrambles along the front of the hull to take pictures. We drove on to Auckland, where we are now —cleaning out our little car and packing up to fly home on the 17th (and arrive nine hours earlier than our time of departure!). It’ll be hard to leave this place, especially now that summer’s really getting into full swing, but it’ll be good to return to some cold weather for Christmas — the Kiwi beach barbeque for the holidays seems just a little too otherworldly! 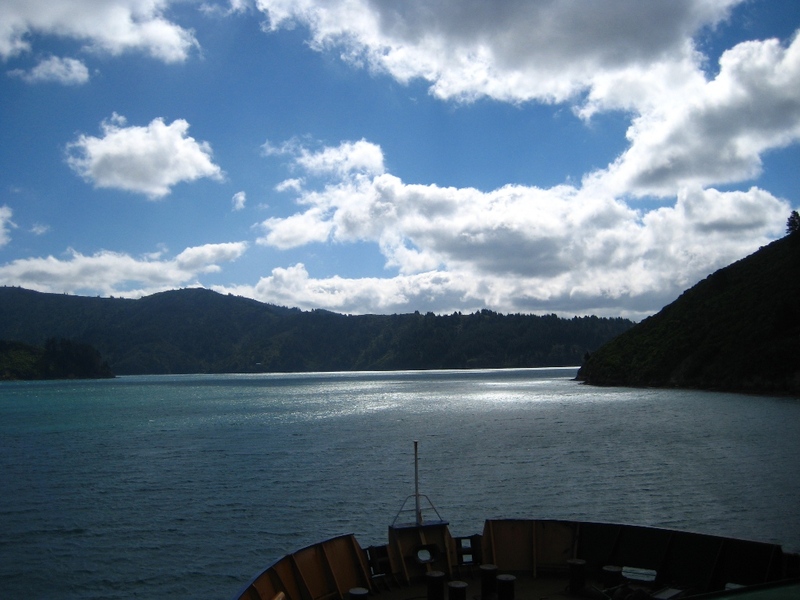 We stayed in Nelson before and after the Abel Tasman, enjoying the fun arts scene and the fresh fish. Our view of the Nelson harbor from an excellent seafood place. 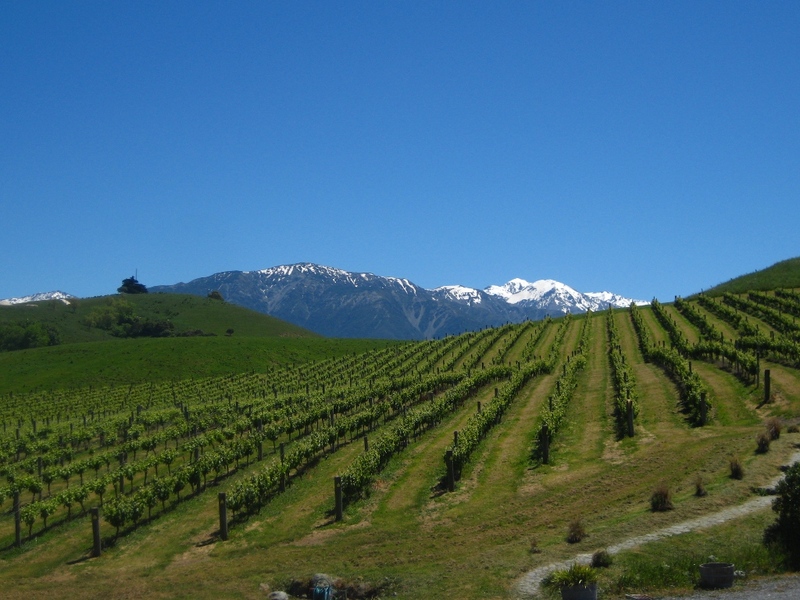 We visited our last couple of South Island wineries before taking the ferry back to Wellington. Even though we’d been gone less than a month, it was wonderful to see our recent home again, but bittersweet knowing that it was possibly the last time. We wandered the streets a bit, taking in some of the tourist sites we’d overlooked before, including a ride on the Wellington cable car and walk through the city gardens. Our obligatory tourist shot of the Wellington cable car, which runs from downtown to the hillside botanical gardens. 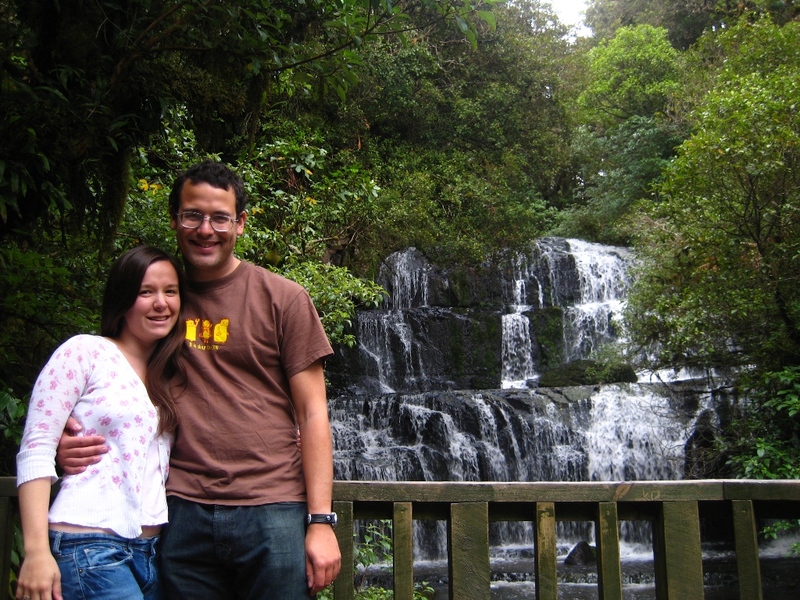 We headed on north, driving through the now-familiar areas of Tongariro, the Waikato, and Taupo. The snow-capped ski destination Mount Ruapehu, the peak of which we'd missed on our previous trip this way due to cloud cover. Watch out, skiwis are everywhere. We stayed a night in Rotorua, a geothermal tourist destination, but didn’t stay long due to the pervasive sulfurous smell and the hordes of picture-snapping travelers, opting instead to press on to beach relaxation further north. 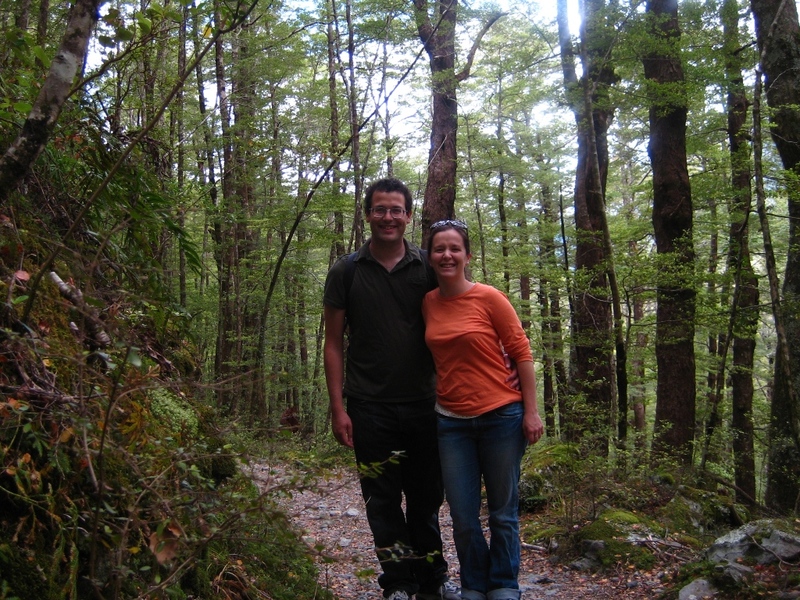 One of our big goals for the South Island was to do an overnight hike in the Abel Tasman National Park on the coast track, one of the nine Great Walks in New Zealand. The whole thing spans more than fifty kilometers; we picked out a 20 km segment at the more remote (and therefore less crowded) northernmost end of the track to do over two days. We could talk about how beautiful it was, how much we enjoyed such an in-depth experience of the park, or complain about the number of evil sandfly bites we left the park with, but the journey is better expressed in pictures. Jonathan the hermit crab sets off down the trail amidst the subtropical bush. Bluebells like these grew wild all over the Abel Tasman. The track ran along the coast, occasionally leading along pristine white sand beaches. This weird, dimpled plant is the native Kowaowao, a.k.a. Hound's Tongue. A fuzzy, curled fern with the coast in the background. We camped in a kanuka tree grove just feet away from this beach on Anapai Bay. Here Jonathan stretches as we watch this lavender sunrise the next morning. Pied Shags were on nearly every beach on the track, and being fairly used to visitors, they stuck around for us to watch them playing in the surf. 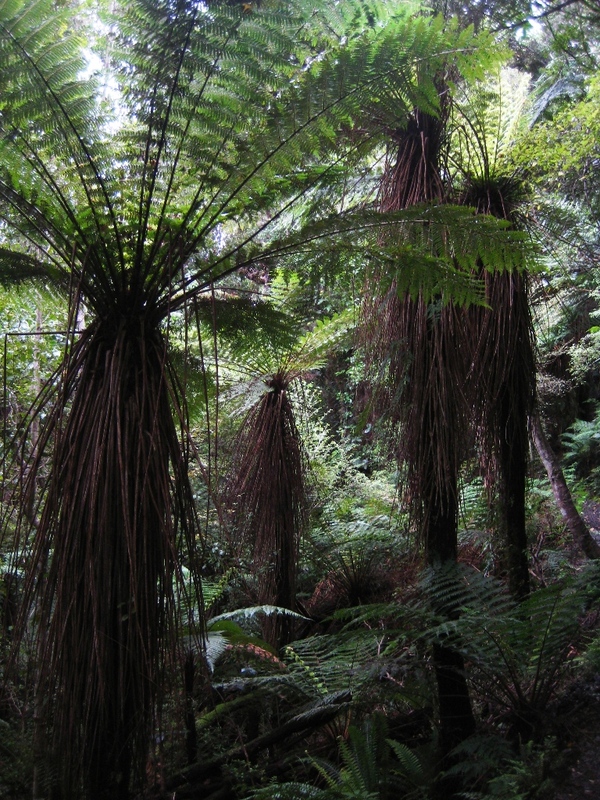 Dead silver ferns hang over a wall of the trail's reddish clay. The introduced California Quail has thrived in the area but isn't considered a pest. We saw quite a few on the second day, including a male quail with a line of about ten babies trailing after him — unfortunately they ran away too quickly for a picture. 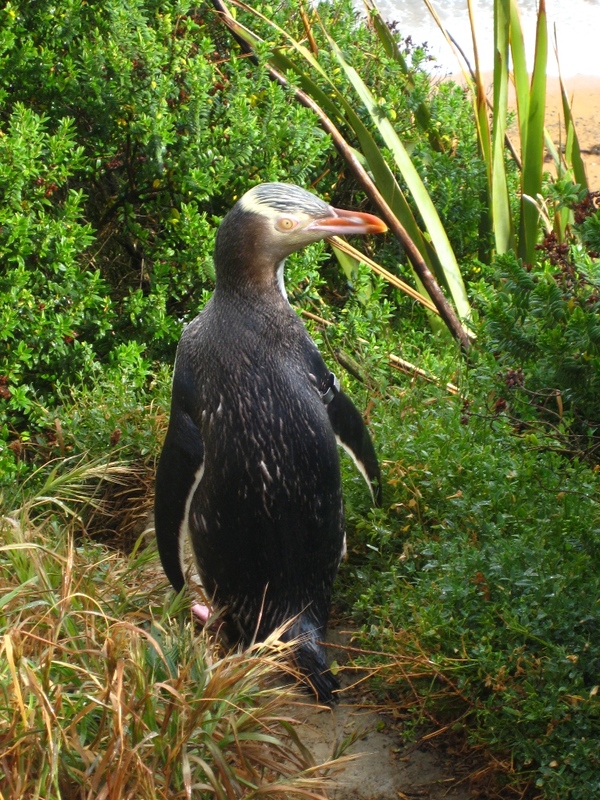 This one, however, struck a pose on a fern for as long as we were willing to watch. The final stretch of the hike toward Wainui Bay and the parking lot, which took us up a big hill with some good views of the bay along the way back down. 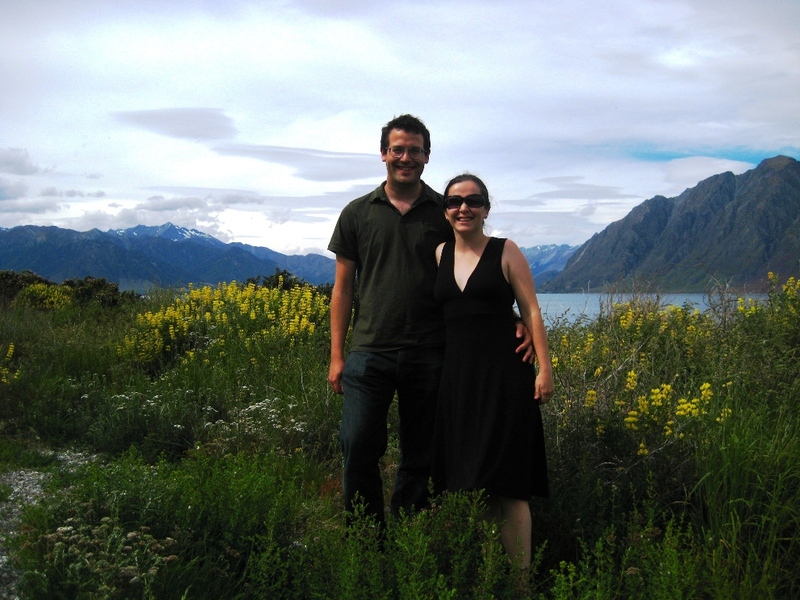 We spent a little time in Manapouri after our boat trip, before heading up to the Queenstown area. 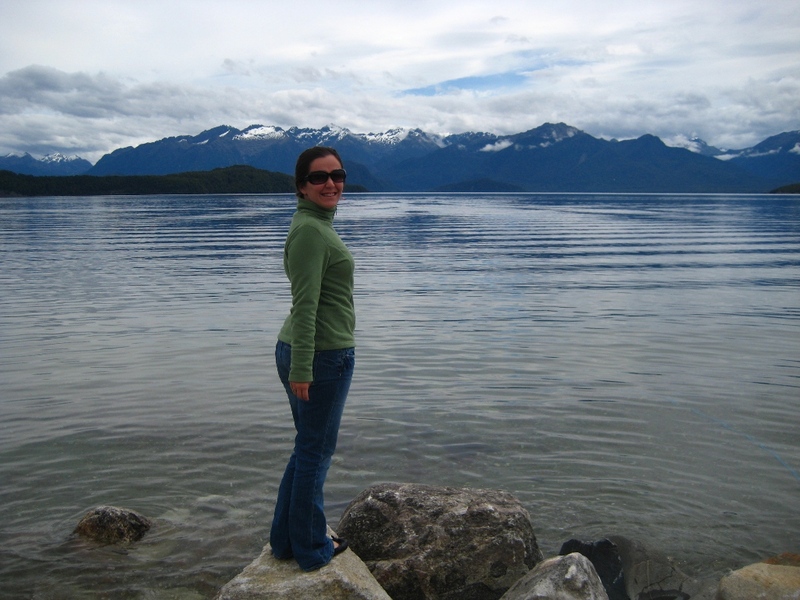 Becky on the edge of Lake Manapouri. 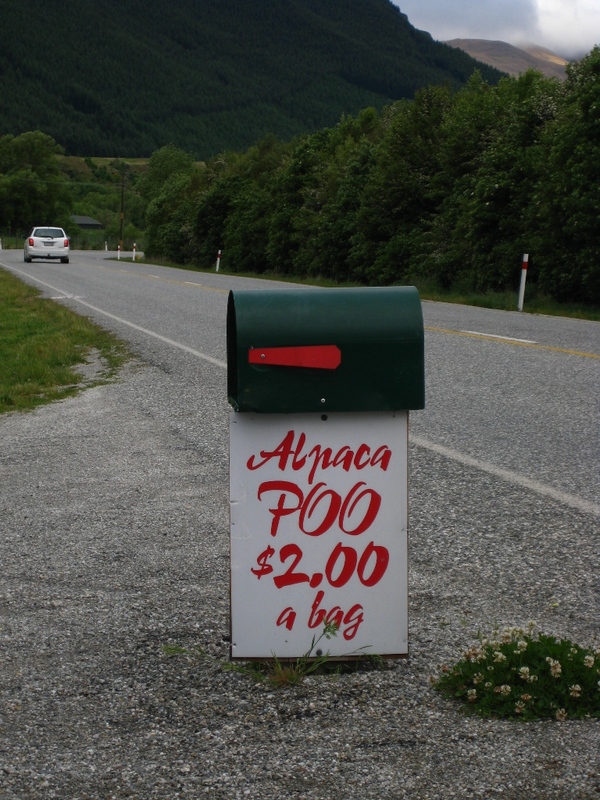 On the way north, we discovered a niche market in rural New Zealand. We stayed in Arrowtown, a cute little former gold-mining town just north of the Queenstown sprawl. We explored the area and found the old homestead of one of the first settlers around here — not too many ruins to speak of in a country with such limited history! The Tobin home, which has probably seen better days. 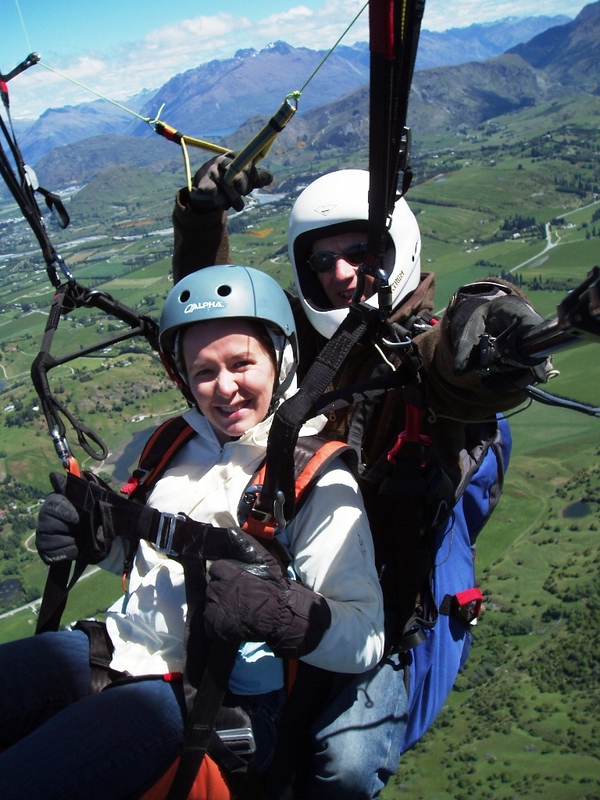 Our hostel owner used to run tandem paragliding full-time; it was a gorgeous day, so he offered to take us out for a flight from nearby Coronet Peak, a winter ski mountain. 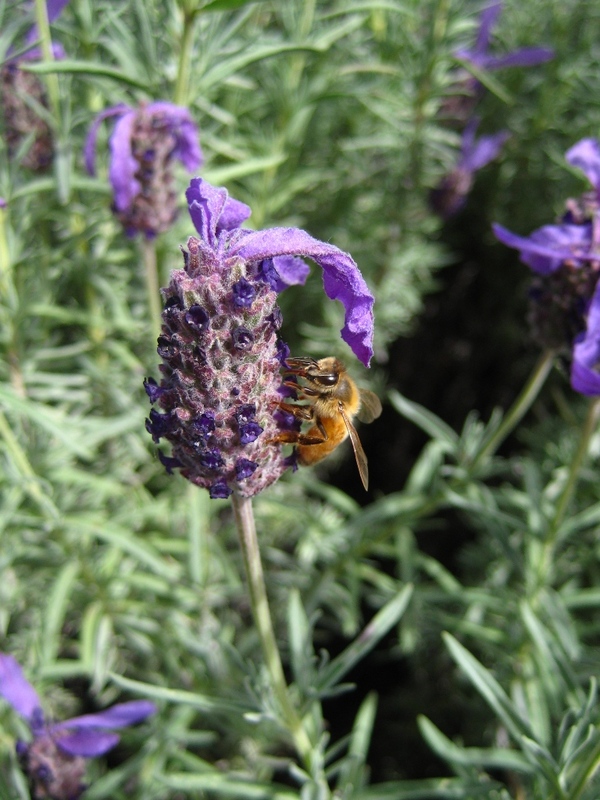 We were both hooked, and we may try pursuing it more at home. 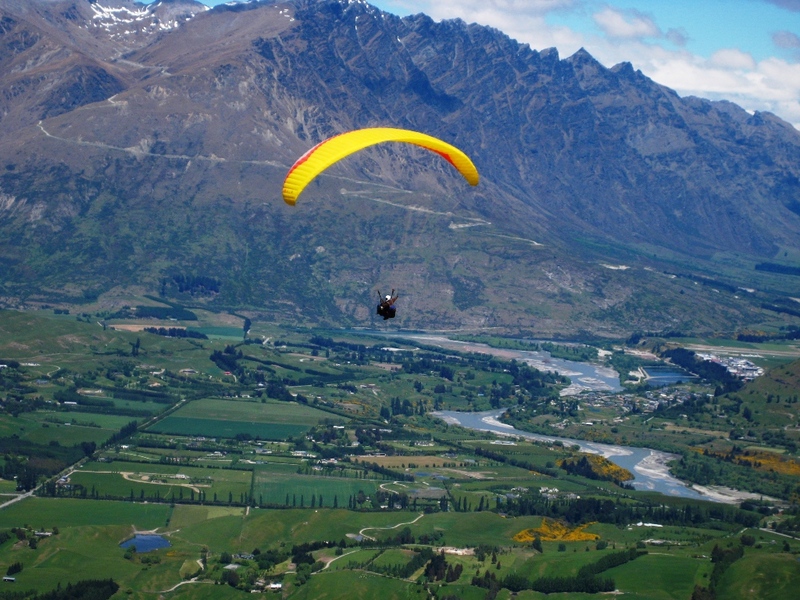 Paragliding over the Arrow River valley with the Remarkables mountain range in the distance. Becky and our guide/hostelier Adin, tandem paragliding. Adrenaline rushes are what Queenstown is known for, and we hadn’t had our fill yet — so we signed ourselves up for the biggest canyon swing in New Zealand. 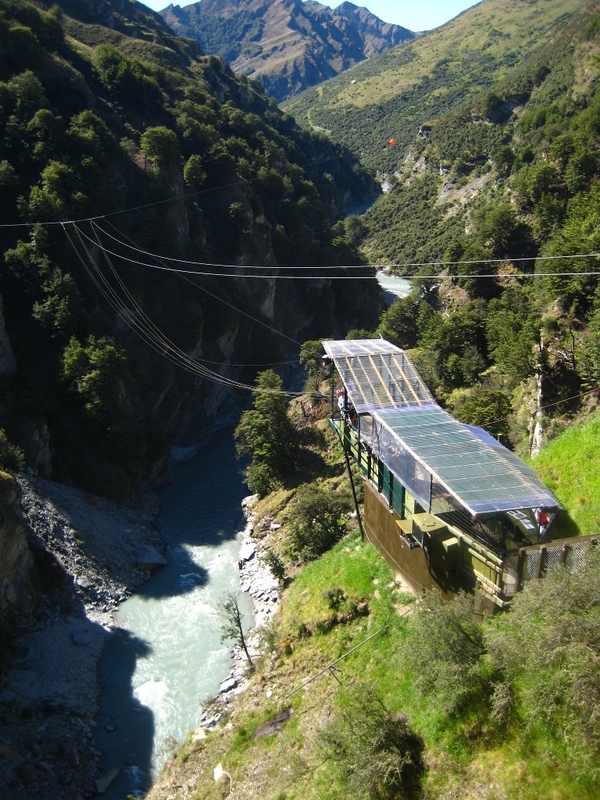 As if our bungee jumping in Taupo hadn’t been enough, this time we freefell for 200 feet before arcing into the swing over the Shotover River, and we could launch from a variety of ridiculous positions. We both loved it (even though Becky felt like the rush was akin to getting in a car wreck) and we each even did a second jump. "Not your average backyard variety swing," they say. 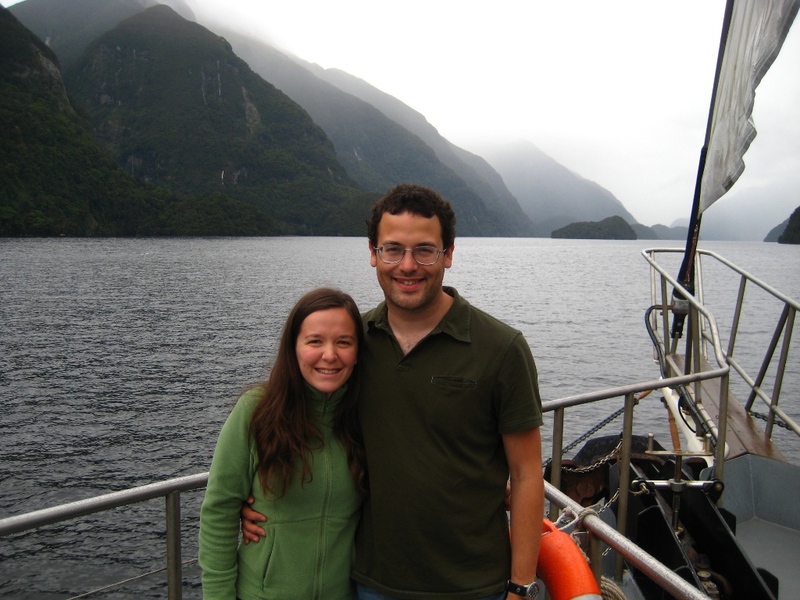 We spent two days and one night on a boat in Doubtful Sound, which is in fact a fjord (not a sound). 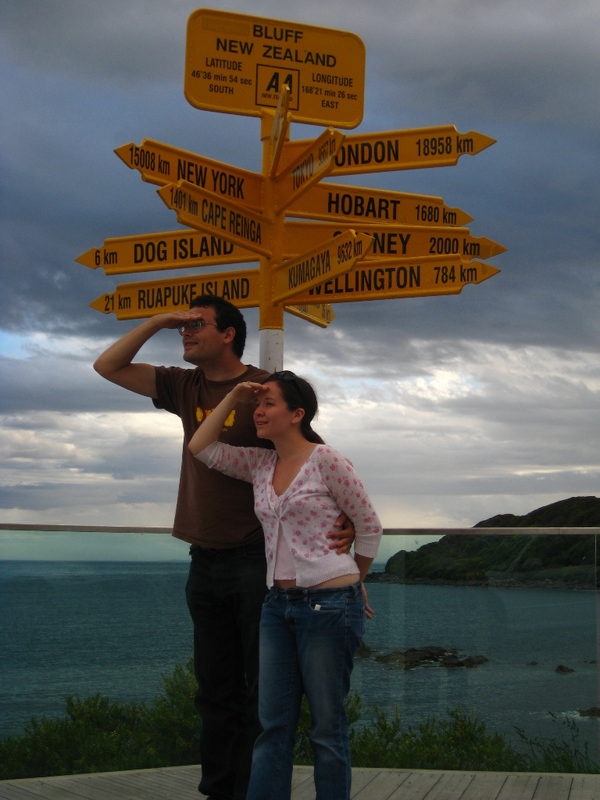 Captain Cook, who explored much of New Zealand, gave it its name because he doubted there would be enough wind to sail his ship back out, so he left it unexplored. Fortunately we didn’t — our boat had engines. 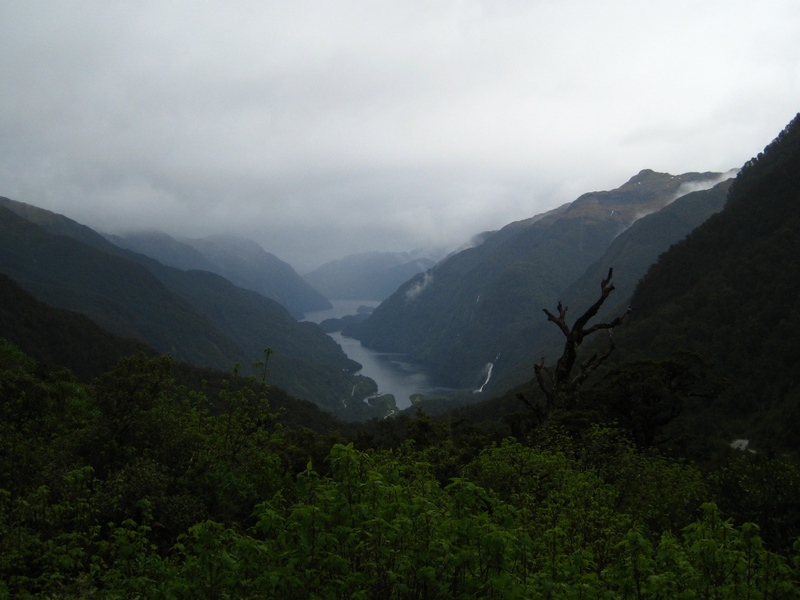 Our first view of Doubtful Sound from Wilmot Pass. 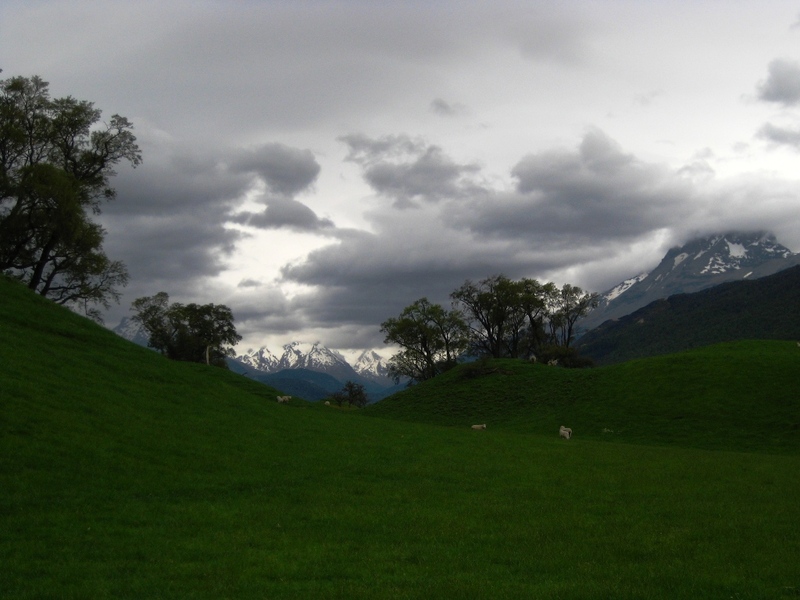 It was cloudy for our entire visit and rainy off and on, but that only made it seem more wild and ethereal. 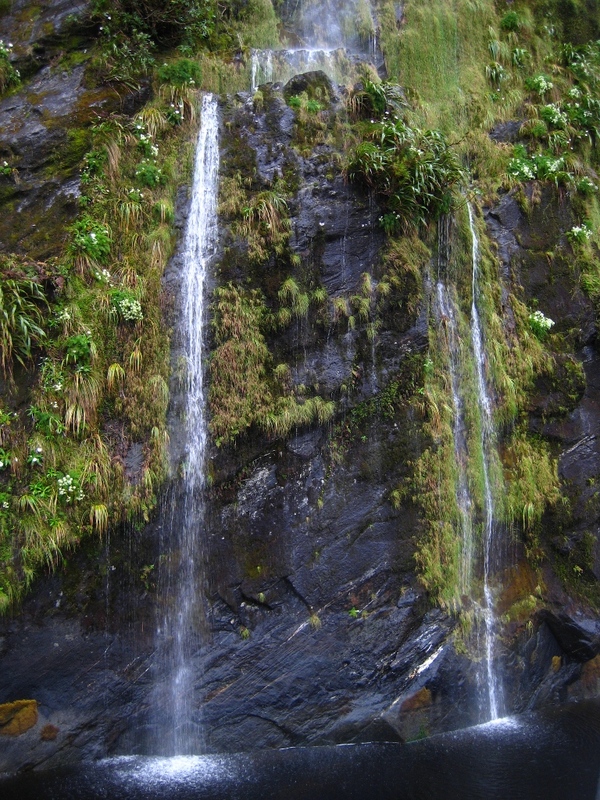 The recent rains created literally hundreds of temporary waterfalls down the steep walls of the fjord — another reason to be happy for the weather. 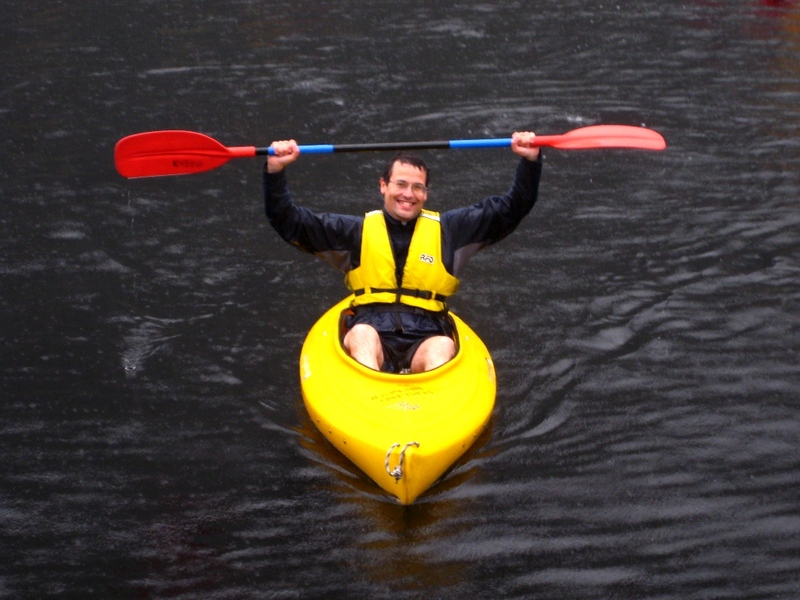 We kayaked around one of the arms of the fjord, getting thoroughly drenched and enjoying every second. 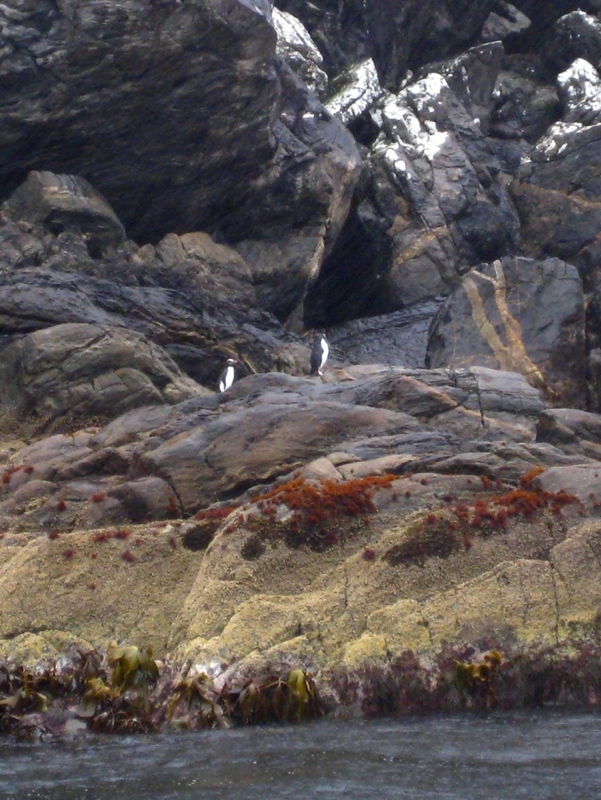 Two Fiordland Crested Penguins strut on the rocks. We also saw an island covered with seals, many napping, some preening, and a few attacking and bellowing at each other. Enjoying one of the brief dry spells outside on the deck — though the rain didn't keep us inside much. 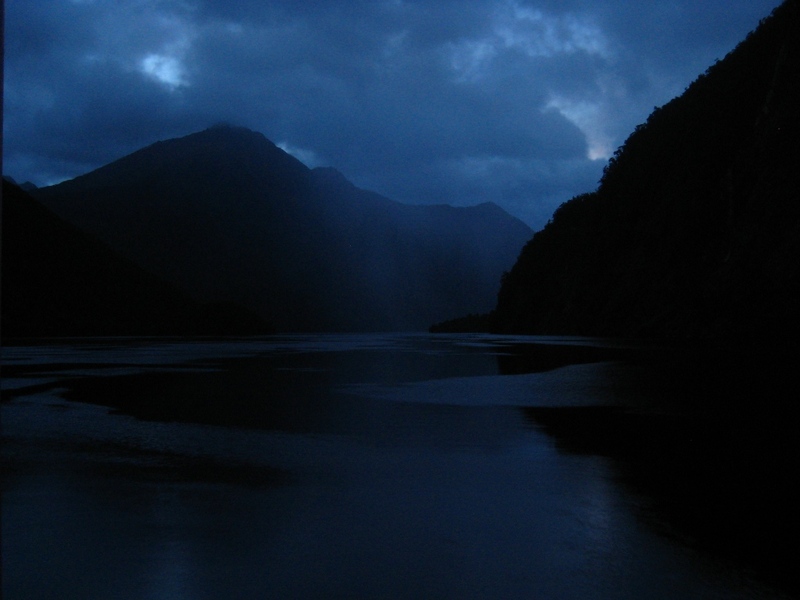 Night falls on the fjord. Still in the Catlins on the southeast tip of the South Island, we visited the Cathedral Caves, a couple of beach caves that connect about fifty meters deep into the caves. They’re only accessible around low-tide — and we still managed to be wading ankle-deep a couple times. 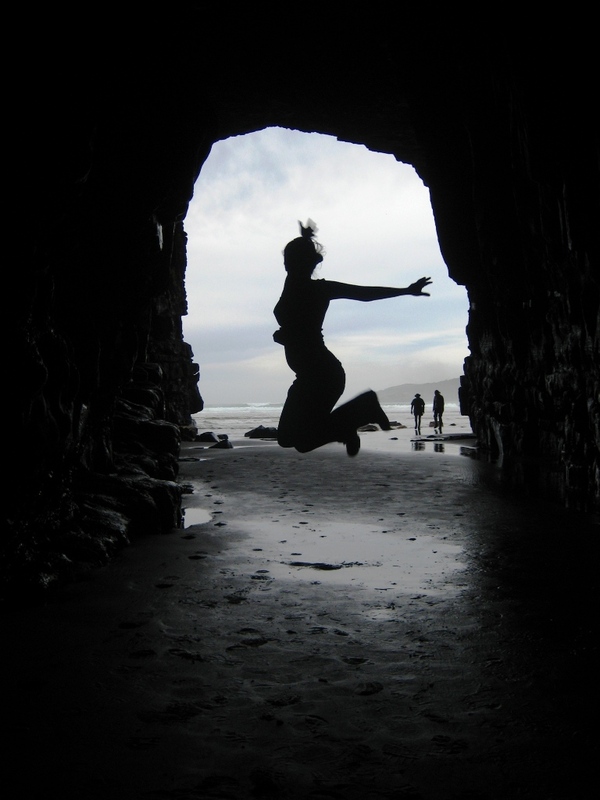 Becky shows off her levitation skills in the Cathedral Caves. There was a gorgeous hike through the rainforest-y bush to get to the caves — in a place with a climate not too different than, say, Oregon or Scotland, the plant life was a world apart. Our hike in the Catlins under a canopy of ferns. Jetting back over to State Highway 1, which we’ve followed south for almost its full length (from the northernmost point of Cape Reinga on the North Island to Wellington, then picking up again on the South Island), we made it to Bluff, the highway’s southernmost point at the ocean’s edge. We contemplate the long swim home. 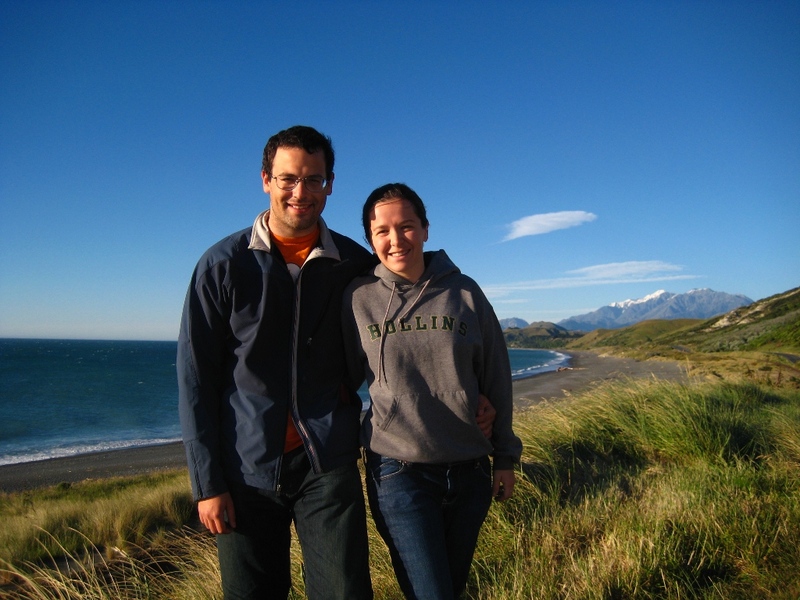 After deeming our suitcases insufficiently buoyant to carry us home, we then began our route up the west coast. 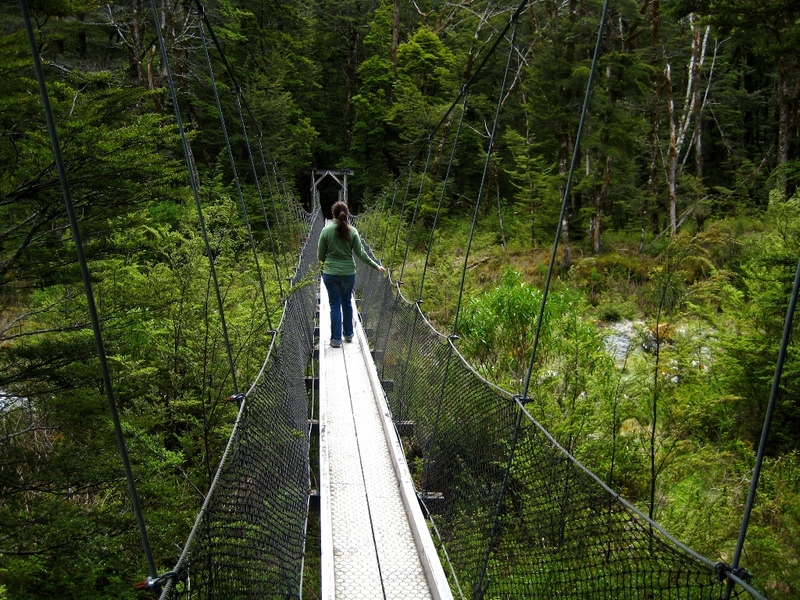 We camped for a couple of nights in Clifden, with a view of an old suspension bridge over the Waiau River. 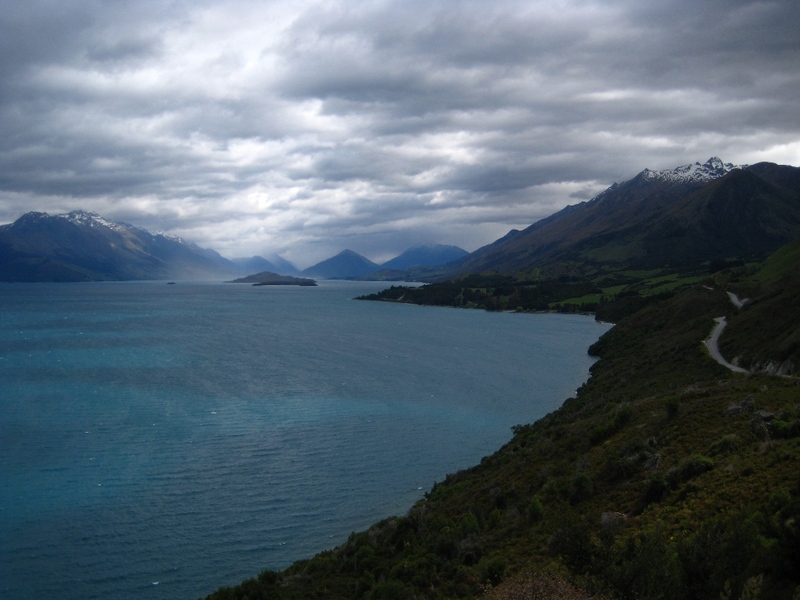 The spot was a good base from which to visit the lakeside towns of Manapouri and Te Anau in the Southern Alps, and with a surrounding population smaller than most DC apartment buildings, it was also a stunning and incredibly dark spot for stargazing. 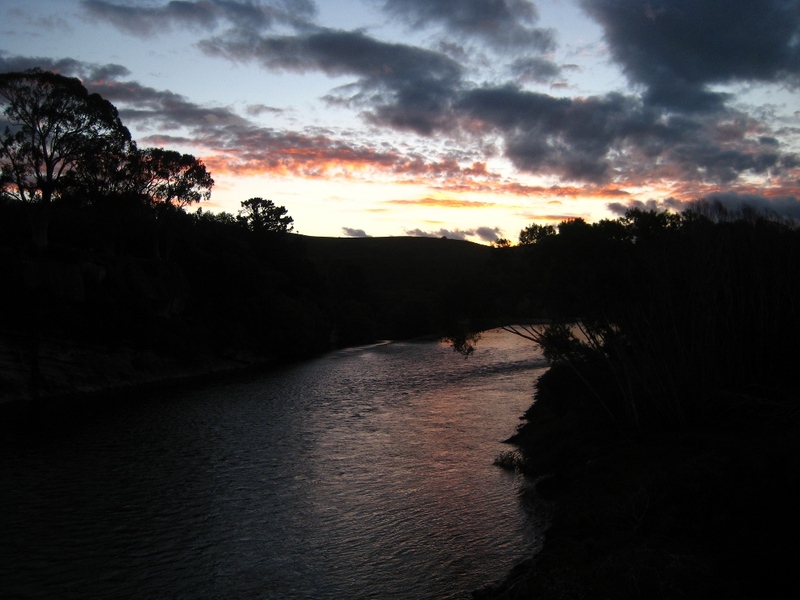 Another gorgeous NZ sunset from the Clifden suspension bridge. The highlight of our visit to Te Anau, which sits on the edge of the Fiordland National Park, was a seaplane ride over the surrounding mountains and lakes that took off from the surface of Lake Te Anau. It was our first (though not to be our last) glimpse of the peaks and untouched wilderness of Fiordland, and it was pretty awesome. 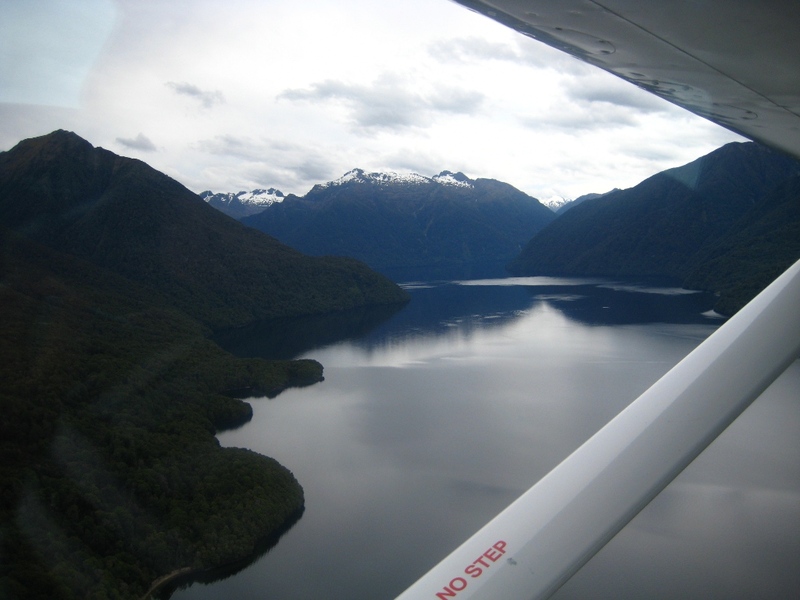 Lake Te Anau from the window of our seaplane. 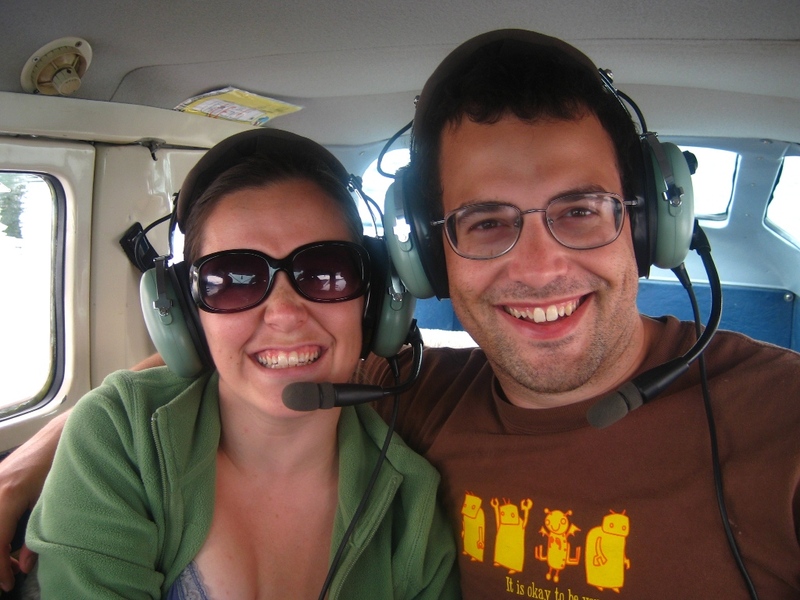 Aeronautical virtuosos Becky and Jonathan prepare for takeoff. 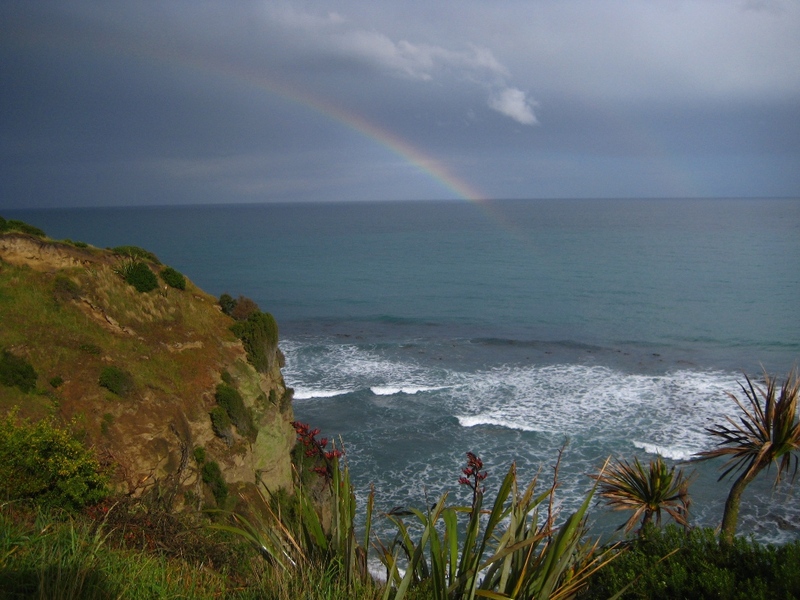 We continued to travel down the east coast, catching this beautiful rainbow amidst the mist near Oamaru. The pretty side of drizzle. 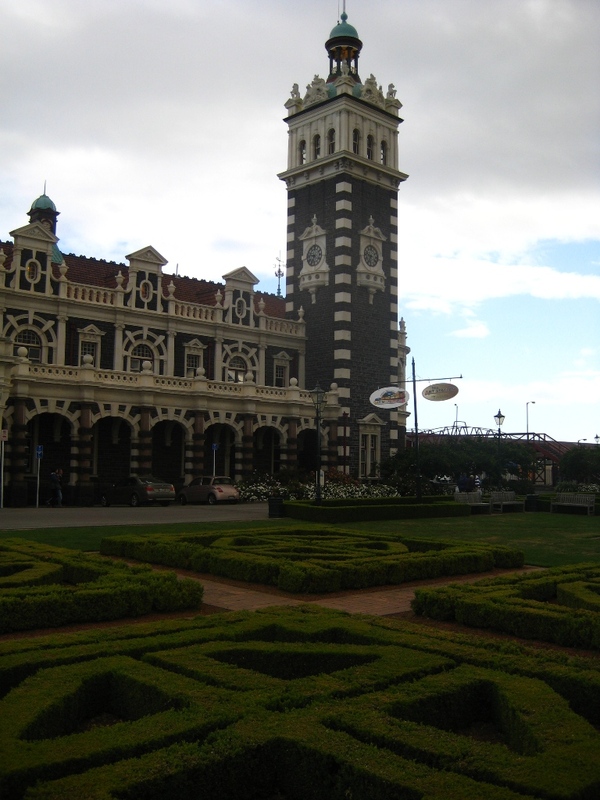 Dunedin is a university town, but with the students all gone for summer break (in November, can you imagine!) we had much of the town to ourselves. The trains stopped running years ago at their railway station, but it’s still maintained by the resident artists’ group and beautifully ornate. Becky had to sit on Jonathan's shoulders to get this picture with the shrubbery. We made yet another detour along a cute coastal road, checking out some little art galleries in towns that didn’t warrant mention on our map. 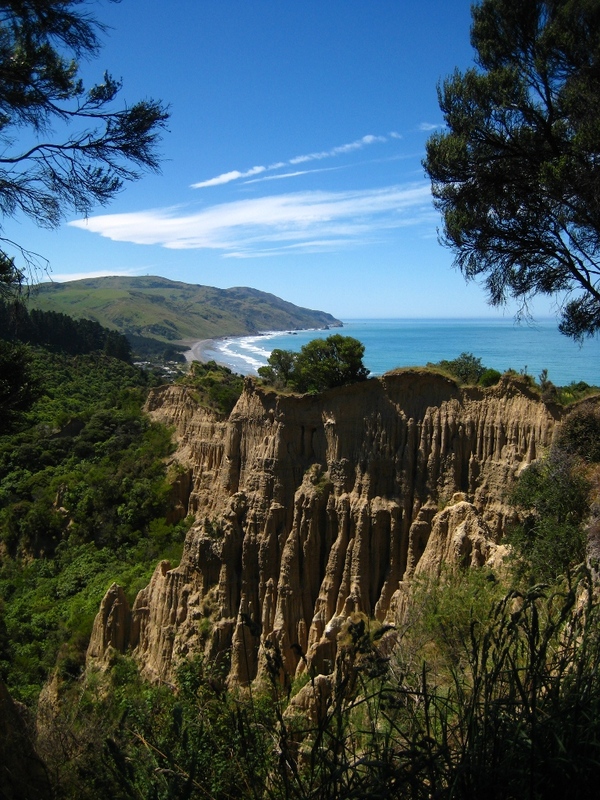 A double bay near Karitane. 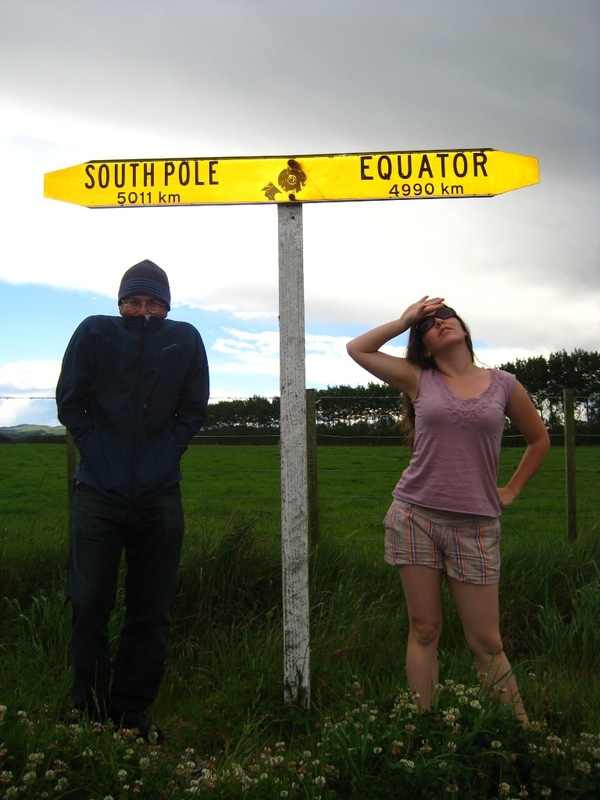 We stayed a couple days in the Catlins, in a hostel on a working farm. (Farm eggs for breakfast!) It was a quick hike to the Purakaunui Falls, surrounded by lush woods. Nearby was NZ’s version of Niagara Falls, but at just a couple inches tall it wasn’t quite impressive enough to live up to its name. 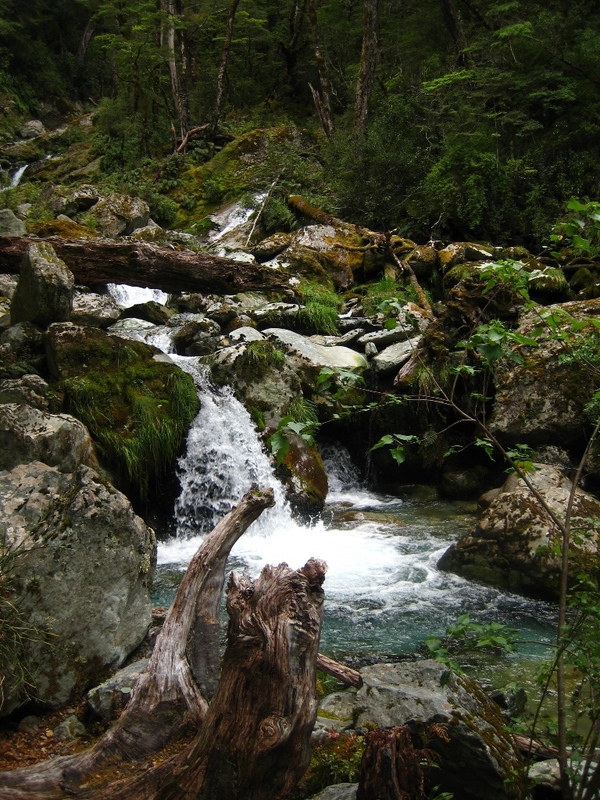 A morning hike down the falls. 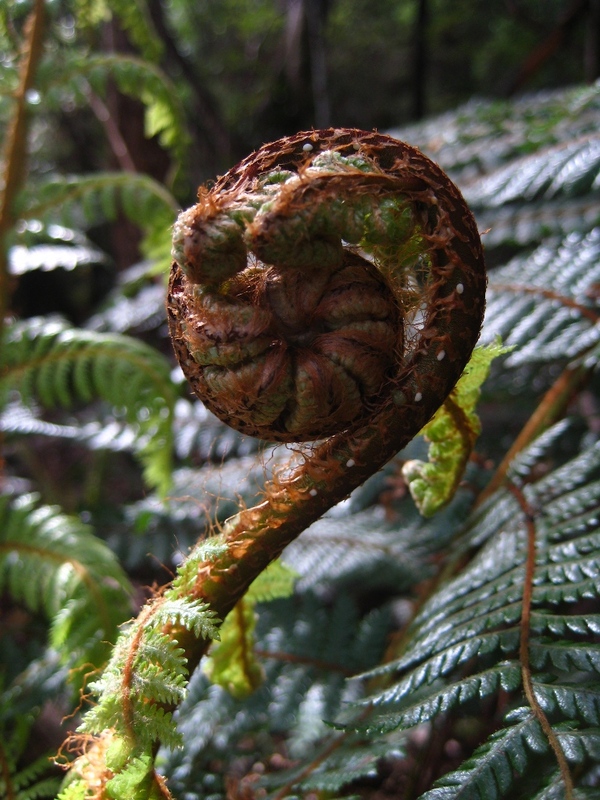 New Zealand's iconic koru plant, growing in the woods.